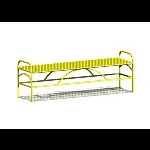 Description: MB Series Metal Bench Model: MB Series Metal Bench These steel mesh bench designs are very durable and versatile. 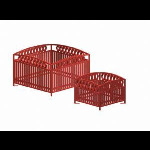 With the three options of installation you will find one to fit your application. 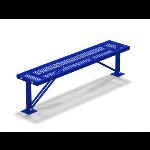 These benches come in many colors and custom colors are available. 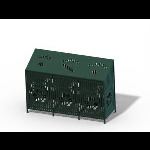 Description: Breckenridge Recycling Center Model: Breckenridge Recycling Center Keep America beautiful and help our environment with our commercial quality recycling containers. Comes with 36 gallon liners for easy removal and front opening doors with latch. Lettering is customized to fit your needs. 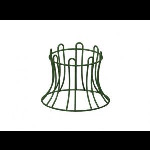 Description: Novak Series Bike Rack Model: Novak Series Bike Rack Novak outdoor steel bike rack provides strength, flexibility and aesthetic value necessary for commercial or residential projects. 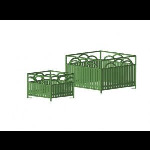 The Novak bicycle rack is available in a wide variety of colors. 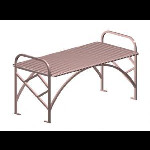 Description: Sunrise Series Bike Rack Model: Sunrise Series Bike Rack The Sunrise bicycle rack adds variety to our high quality steel site amenities. 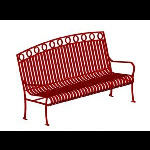 Petersen Manufacturing Site Furnishings can provide the strength, flexibility and aesthetic value necessary for commercial or residential projects. 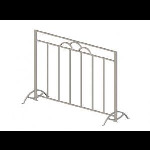 Description: Breckinridge Series Bike Racks Model: Breckinridge Series Bike Racks Breckenridge steel bike racks can provide the strength, flexibility and aesthetic value necessary for commercial or residential projects. 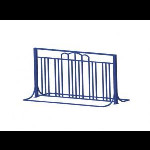 The Breckenridge bicycle rack is available in a wide variety of colors. 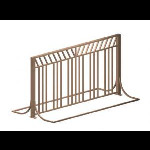 Description: Summerfield Series Bike Rack Model: Summerfield Series Bike Rack Summerfield bike backs are used by state and federal government agencies, fast food restaurants, department stores, educational facilities, parks & recreation departments, residential complexes, and individuals to guard against theft. 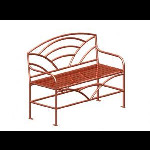 Description: Winsor Metal Bike Rack Model: Winsor Metal Bike Rack Winsor bike racks add variety to our high quality steel site amenities. 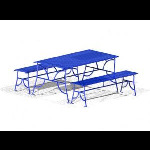 Petersen Manufacturing Site Furnishings can provide the strength, flexibility and aesthetic value necessary for commercial or residential projects. 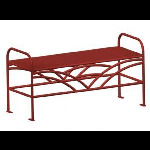 Description: Novak Series - NVFB48 Metal Bench Model: Novak Series - NVFB48 Metal Bench The Novak Bench also comes without a back. This streamlined appearance would be sure to add dimension to any setting whether you're going for a modern or traditional look. The simple design will match any decor. 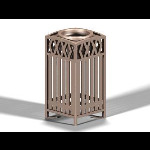 Description: Breckenridge Series Ash Urn Model: Breckenridge Series Ash Urn Complimenting the Breckenridge series is our upscale cigarette ash urn deisgn. 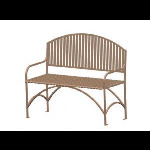 Description: Summerfield Series - SFB72 Metal Bench Model: Summerfield Series - SFB72 Metal Bench If you prefer a backless bench, our Summerfield bench will be sure to please. 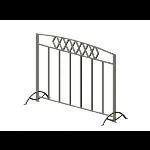 With elegance and function in mind, the Summerfield is ideal for use in any setting. 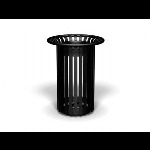 Description: Novak Series Ash Urn Model: Novak Series Ash Urn An expansion to our Novak series is our sleek lined trash receptacle and snuffer design. This new creation will add beauty and convenience to any site. The trash receptacle includes a rigid plastic liner for ease of trash removal. 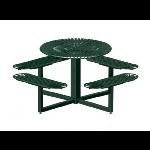 Description: Breckenridge Series Metal Table Model: Breckenridge Series Metal Table The Breckenridge metal table is a 3 piece set that can be easily moved. 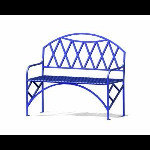 This traditional design is perfect for restaurant patios, decks or any setting. Some assembly required. 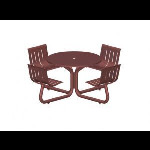 Description: LTRND Round Table Model: LTRND Round Table A nice addition to the deck or patio, the LTRND series is one of our most comfortable steel tables. Available in 2 or 4 seats. 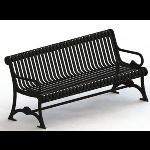 Description: ISUB Metal Bench Model: ISUB Metal Bench The ISU park benches were designed for beauty and built for durability. 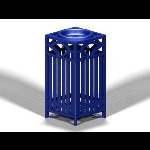 Handcrafted using high quality steel and the powder coat finish will protect even in the harshest settings. 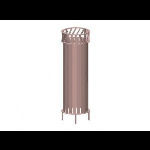 Description: Avenue Cigarette Ash Urn Model: Avenue Cigarette Ash Urn This cigarette ash urn matches the Avenue Series waste receptacle and has a hidden plastic liner to empty the ashes into.